In 1899 the Distinguished Conduct Medal was the only gallantry medal that could be awarded to Other Ranks and was second in rank to the Victoria Cross. Over 2,000 DCMs were awarded for the Anglo-Boer War, it is unfortunate then, that for the vast majority of awards the citations have not survived. A significant number of awards for good service during the war and not action in the face of the enemy. Therefore when buying and or researching a DCM one cannot say for what action it was awarded. For The Register I have been going through the DCM awards and it has become apparent that for many awards there is scope to determine the circumstances of the award. We probably won't be able to say that Pte Tommy Atkins charged with his bayonet, killing or capturing a great number of Boers. But more can be found, for example let's consider the award to Lance-Corporal 3510 William Brown (real name Fowler), 2nd bn Northumberland Fusiliers. This would suggest that Fowler’s DCM is for this action which has no date and just the approximate location of “Witwatersburg” – a range of hills or mountains. One is assuming too that the “Lance-Corporal Brown” is the same man as received the DCM. That aside, Fowler’s service papers (WO97), not quoted in the catalogue, state clearly that he ‘Distinguished himself at Skeerpoort 04-08-1900' Is this the date and place of the action described in the regimental journal? Unfortunately not, the two men mentioned as killed; Doyle (Pte W 5141) and Jamieson (Pte J 1656) are recorded as killed in action on September 5th, 1900 at Hartebeesfontein. The casualty roll confirms four were wounded at this place. So, there is significant doubt over where Brown won his DCM. What do we know of the action at Skeerpoort on August 8th, 1900? There are no recorded casualties here for this date. The two histories of the Northumberland Fusiliers (Wood and Walker) do not help. Skeerpoort was not in The Gazetteer either, it has just been added. Skeerpoort is to the west of Pretoria below the Magaliesberg, a few kilometres east of the present day Hartebeestepoort Dam. Eighteen men from a variety of units were casualties here (only one killed) from September 1900 to November 1901. 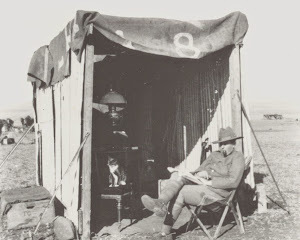 The rugged Magaliesberg was a favourite bolt-hole for the Boers, the terrain favoured those with local knowledge. There were a few well known roads through the passes (“Neks”) that the British blocked. Later the British built a line of blockhouses across the top of the range. In early August 1900 British forces were preparing to block the Neks to prevent Christian de Wet crossing. More reading around could reveal exactly what the Northumberland Fusiliers and Brown did to earn his DCM. It could be that Fowler's award, like others in the war were for more multiple acts over a period of time. When I have completed work on the DCMs I will publish statistics on showing for how many DCMs the battle or location for which it was awarded are known. The challenge then is to do the research into individual awards to reveal more.